When the first Zelda came out for NES, it was an expansive game, a massive adventure, more than any game before it. For the second Zelda, they decided to take the series in a different path, mixing the overworld adventure style of the first Zelda with a side-scrolling battle section, and RPG-like stat and skill building. Well, for the third Zelda, which would be this game, they decided to go back to the format of the first game, as opposed to continuing with the idea of the second one. Some elements from the second were carried over, but, for the most part, this is more a follow-up to the first Zelda game than it is to the second. So, if you've played previous Zelda games, that's the type of game to expect this to be. If you've never played a Zelda game before (or have only played later ones, which are also similar in style to this one), don't worry, the rest of this review will contain a detailed description of the game itself. Just trying to give a starting point for reference. In any event, enough about other Zelda games. Whether you've played some Zelda games before, played every single one of them aside from this before, or have never even seen a Zelda game before, you're here because you want to know about this Zelda game. What this game is, is a massive adventure, spanning over towns, forests, deserts, swamps, and lands. It's a trek through dungeons, solving puzzles, fending off enemies, getting rupees. It's going through towns, using your rupees in shops to buy items, talking to people, gathering information. It's unraveling one story, only to find out it leads into another, much larger story. It's about defeating new enemies, and conquering old foes from the past. It's about your family's quest, about rescuing Zelda, and about saving Hyrule. The game starts off innocently enough, you're sleeping soundly in your bed, in your uncle's house. Outside it's raining, but you're quite safe inside. Out of the darkness, however, comes a voice. Someone crying for help. Not an actual voice, but a voice inside your mind. You hear it and wake up in your bed. Your uncle has also heard it, grabs his sword, and heads for the door, with a word of warning to you to stay in bed until he comes home. After he leaves, you can't help but worry, about him and about this mysterious message. Out of bed you come, and head outside, into the rain. You head for the castle with not a thing to protect you against your surroundings, no sword or anything. You make your way into the castle basement, to find your uncle, lying wounded against a wall. He gives you his sword, and asks you to continue his quest, to save Zelda. This is where things start off. Going only on a voice, and following your uncle's path, you head into the unknown, to rescue someone you've never met, and embark on a quest much larger than you could ever imagine. 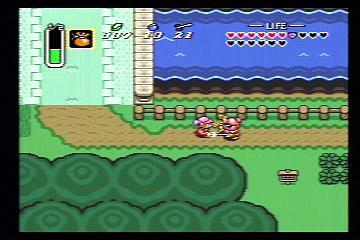 In The Legend of Zelda: A Link to the Past, you take control of Link, in your quest to save Hyrule. Once you're armed with your uncle's sword, you're properly equipped to begin fending off foes. As you make your way through the different areas, you'll run into enemies who must be dispatched. Along the way through the game you will also pick up a variety of items which will help you on your way. Arrows to attack enemies from a distance, a torch to light up dark rooms, bombs to blast into secret rooms and passageways, and many other things. As you make your way through the game, you will pick up all these items, which will open up new areas and possibilities to you. Hardly ever will you find an item with no specific practical purpose, most every item can help you reach a new room, open a new path, or some other hidden secret along the way. It's not only a matter of finding the items, but figuring out where they're used and how they can be used. Many items can also double as a weapon, increasing your arsenal with which to attack enemies. Throughout the course of the game, there are about a dozen different dungeons you will have to make your way through (not giving an exact number not only not to spoil that, but there are some things that are "kind of like dungeons" but might not exactly be considered one). These are spread apart though, it's not as if you'll be going directly from one to the next. After you make your way through the castle that you've started your quest in and have completed your first task, you'll find yourself outside, and having to figure out what to do next. Throughout the course of the game, you'll have to make your way through the overworld map, exploring new places, discovering new things, and finding out where exactly it is that you need to go. So, the game is essentially broken up into two distinct parts, the overworld exploration, and the dungeon solving and fighting. On the overworld section of the game, this is where you will explore towns, talk to people, and gather information (although you will still run into plenty of enemies along the way). In the dungeons, you'll have to fight off hordes of enemies, find keys to unlock doors, discover new items and passageways, and find your way through the labyrinths to the end, where you will fight a boss and accomplish your goal for the dungeon. Then, you'll make your way back through the overworld, often with a new item at your disposal, trying to find the next dungeon. NOTE: The following paragraph (the one after this) contains what would likely be considered "spoilers," as it discusses in some detail items and situations you don't encounter until about a third of the way through the game. It doesn't go too into detail with description, but, I feel it could be very useful in the understanding of some of the gameplay mechanics. If you don't want to read it, just skip over the next paragraph and go on to the one after. It's not too critical where if you skip it you'll be missing something, I just felt it could be useful to people trying to get a feel for what you're doing in the game. 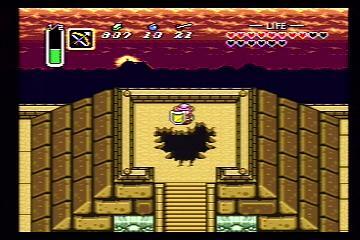 Part of the way through the game, you'll encounter what is known as the "Dark World." This is (to make a long story short, and trying to minimize spoilers) basically an evil version of Hyrule (the normal area where you start off being known as the "Light World."). There are more monsters, less people, towns are in shambles, and a whole variety of other problems. Shortly thereafter you'll acquire an item, a Mirror, that will allow you to travel between the two worlds at will. This becomes quite a critical element, as the two worlds interact with each other. Something might need activating or moving in the Light World before you'll be able to access something in the Dark World, or other similar situations. Most of the latter part of the game takes place in the Dark World, but, you'll still find yourself hopping back into the Light World numerous times as you need to find things, explore areas, or accomplish tasks. Ok, if you stopped reading with the previous paragraph, it's safe to rejoin now. In any event, that about brings to a conclusion the discussion on the actual play style of the game itself. It's a balance between fighting, puzzle solving, using different items, talking to people, exploring, and all of that. As you travel between the dungeons and the overworld and everywhere else, the game will continue to open up and expand before you, revealing a huge world in which you can explore, interact, and discover. Graphics in the game are quite impressive. Everything is bright and vibrant, or dark and moody, or whatever else the mood of the game determines. There's a huge variety in the different landscapes and sceneries you'll explore, from forests to deserts to dungeons and everything in between. There are some very nice effects pulled off with fog and other such things as well. Overall, the graphics are very nice, with little splashes of extremely impressive stuff mixed in. Music has a very good variety to it as well, with different songs for different areas, be it a town, a mysterious forest, a dark dungeon, or wherever it is you happen to be. All of the music blends well with the areas perfectly, fitting the mood and tone of the game, and sounds very nice. As well, there are numerous sound effects, enemies charging, bombs exploding, swords clanking, and many other things. The game is a very decent length, not overly long, but with many dungeons to make your way through, places to explore, things to interact with and discover, where you most certainly won't feel that the game is over too soon (although you'll likely find yourself wishing it would never end). As well, even once you've beaten the game, there are still many reasons to go back through and play again. Go through exploring new areas, seeing if there were things you missed, secret rooms to explore, and a wide variety of things you may have missed which weren't necessary in order to complete the game but which are fun to go back and discover later. In most cases you don't need to talk to people too much if you don't want, so you can go back through seeing if you talked to everyone, explored every house, every corner, and all the things there are to do. As well, you can challenge yourself to go through the game without dying, perfecting your fighting and everything. There are many things to do where it's certainly worthwhile to go through the game again. Not to mention, the game is so fun to play, you'll find yourself going through it again simply for the enjoyment of doing so. The Legend of Zelda: A Link to the Past is easily one of the best SNES games available, and is among the top games ever. If you have enjoyed Zelda games in the past, either the older ones or the newer ones, odds are you'll enjoy this game as well. If you enjoy adventure games, where you're exploring, discovering things, finding and using items, talking to people and searching out secrets, this game is for you. If you like a good dose of fighting mixed in, there is a nice variety of enemies, and a number of items you can use to fend them off with as well. This game has things in it for most anyone. I feel it's fairly safe to say, if you like video games in general, there's a very good chance you'll like this game. Definitely a game everyone should at least try, and one that many people will end up loving.